Thinking about jumping back into Mechwarrior Online now that they've finally released Community Warfare... I'm so confused though, because one of the things that makes it so fun is the one reason I've began to distaste violent games like this: Entertaining promotion of war violence, nationalism, and divisiveness (even granted it's just a game). I have been awaiting this for years. Very excited. If any of you are big Homeworld fans, watch this whole video. I promise you will absolutely love it. Too bad the reflections look terrible. That could be fixed with some real time reflections which have been done by the community for UE4 a few times. Too bad the reflections look terrible. They look fine to me, except in some places like at 2:18. I guess that's what you get for using SSR. My first time playing 'Oregon Trail', ever - all five of my party make it, and I even have plenty of supplies to spare at the end; good judgement, or just good luck? I've recently been getting really into Planetside 2 and Space Engineers. As you can see, my preference are RPG games, I really dont like FPS, except a few like Unreal Tournament 2004. Well Spacer Europa Universalis 4 is a game where you command a nation from the 1444 to 1821. The Picture I posted had a Mod that makes the game start in 51 AD and end in 9999 AD, where I played in japan and formed it where I began invading what was left of Korea and then eating up the released nations my former ally was forced to release from rebels. For actual info I'd suggest the wiki or the developers website. If you're like me and watch a ton of youtube let's plays on games I'd suggest Arumba or Shenryyr. HarbingerDawn, yeah, I'm a Homeworld fan, although I only played HW2 and I didn't play too well in multiplayer against other player. But I have a question. WFT is this? I would appreciate any additions to the well-known HW graphics, but really, I don't want them to be 10 years behind current tech level. I would not simply give my money for that, it doesn't pay off. That would be better to be more radical about the new designs like some of the newer models in EVE Online introduces, than just change NOTHING but texture resolution and demand something from people. At least they could have done even better - introduced new models and old models and let the people to switch between them. Or even share the high-res "old" models with mod-makers - I would like it SO much. But I have a question. WFT is this? At least they could have done even better - introduced new models and old models and let the people to switch between them. This is what they did. All HW1 ships have entirely new models. At least some HW2 ships also have new models, though I don't know if all do. And the original games are included in the collection along with the remastered ones, so you can also see the originals that way. 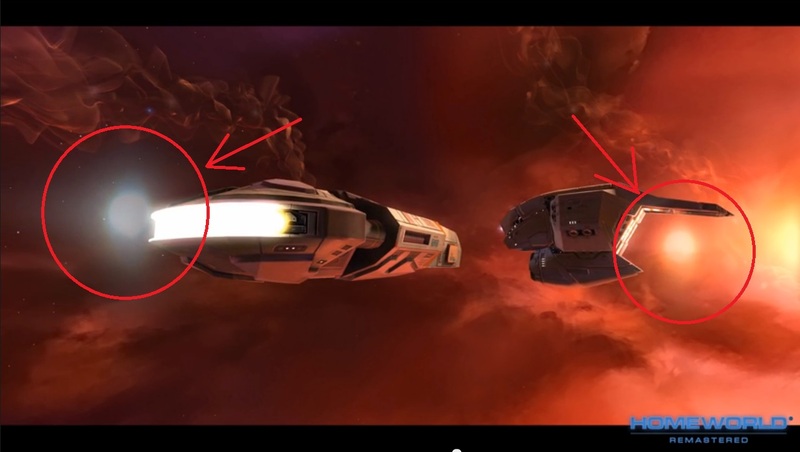 Personally I am happy that they are just increasing the detail of ships without redesigning them. The ships designs in Homeworld - especially HW1 - were great.